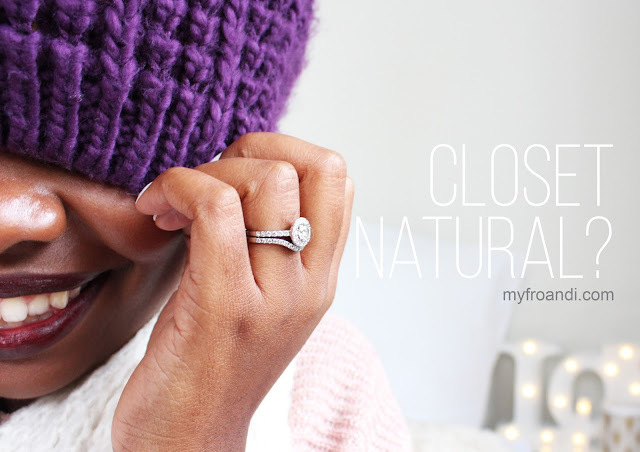 Are You a Closet Natural? So this is a topic I haven’t really formed a solid opinion on yet. I know that being natural is very much a personal choice and different women go natural for different reasons. I didn’t even realise it was a thing until more than one of my readers, friends and colleagues mentioned it in coversation. So imagine my surprise when I read a mail recently from a woman who told me she really appreciates my blog and content etc. And she feels that after being natural for more than two years, she’s finally ready to debut her fro. Huh? Well, she decided to stop relaxing her hair awhile ago but all this time she’s been covering her natural hair up with wigs, weaves, braids – anything so that no one would see her own hair. Now, I know some of you may be thinking well, she’s protective styling that’s good right? Yes and…no. For me I interpreted that mail along with some other communication I’ve had with women that there’s the natural who occassionally/regularly puts a weave or wears a wig and isn’t phased by showing her own natural hair in public in between those styles. Even if it’s just for a few weeks. Then there’s the natural whom nobody, except perhaps her significant other, even knows that under her extensions, she’s natural. She is self conscious, she’s insecure and worried she’ll be judged if this is revealed to anyone. So she makes a conscious effort to be in the “closet” about her hair choice. It’s something that I’m intrigued by. And would like to know more about. The ladies who have jumped the fence into the world of natural but are hiding in the corner for fear of being outcast somehow – from a job, by a potential life partner or from socially being labelled as “beautiful”. I felt sad when I read that mail from my reader. She had the confidence to say no to relaxer but wasn’t able to fully come out for all of those years. I hope she and other ladies find the inspiration to fully embrace their natural and no longer feel like it’s a secret they need to hide. Are you or were you a closeted natural? Do you know someone who is? What are your thoughts? Weigh in! Well am not a closet natural myself but sometimes I want to be.The environment that I work and live in hasn't fully grasped the concept of natural and think having a weave or relaxed hair is better or dare I say superior than natural hair.I have been asked if my husband is now sooo broke he cant afford to give me money to get my hair done and have been told that I look like a sangoma's assistant.Some comments I cant say but its times like that,that I want to cover up and hide. Being natural has taught me to be confident in who I am and how God made me although its not always easy I dont regret my decision. That's so sad, thank you for sharing this with us. It's horrible that in this day and age that we are under such scrutiny, as women. Sorry you have to hear such negativity but I'm glad you're able to see beyond all of that and still be confident in what God gave you. I find it sad though this “am natural but no one knows except for me thing” that women go through. But then again I don’t know how they feel and what kind of pressures they are subjected too or what trauma (if ever there was any hair trauma) they went through, etc. One of my closest friends recently shared her fears of doing the big chop, her explanation was the last time she had short hair she was very young. As an adult she has had relaxed hair and styles it with braids/ cornrows/wigs and when the weave trend hit SA she added that to many of her hair styles. While her fears may be real for her I found many of them to be lies she has told herself and come to believe them. I had a long and sensitive talk with her to convince her to do the big chop as her hair was severely damaged after her pregnancy and chemicals were simply making it worse (I also told her she can relax her hair if she wants but only after her hair has recovered – see i am not by any way trying to convince any of my friends to go naturla unless they make that decision themselves). Long story short..she did the big chop and hid her short hair under a wig. *Really ? But why I asked*, same stories and and and…it took a week after her big chop for her to finally wear her own TWA and a month to be comfortable with her TWA and feel somewhat pretty- she is says its work in progress but am happy that she is comfortable with her hair above all. Its been a couple of months and she is finally happy with her hair, how it feels-looks and she now ask “why was I fussy over my own hair, it suites me”. One woman’s Natural Hair Fear’s battle won but I think many woman go through the same motions if not similar HENCE THEY ARE CLOSET NATURALS. They need a friendly and non-judgemental support. The NATURAL HAIR struggle is real for many women out there. I still don’t get it but I try my best to support those who need the support and are open about their Natural Hair Fears. Thanks for weighing in! Great share about your friend and her struggles. It's very real for some women, and easy for some yet very difficult for others. Some need a hand to hold through their journeys. So your friend is lucky to have you. Many of us get into this cycle that we can't get out of, at least not easily so it helps to have support like you said. Good on you! My wasnt that I was ashamed I just ddnt how to style and care for sor braiding made things easier bt now bcos of this site ofcos fro is out all da tym..
Like u were in my mind! I have been waiting for such a topic esp. from a hair blogger like you. Ofcz i do know friends & u can guess how I have tagged them on your 'Insta' to peep their eyes here. 'Let your breathe! Girl embrace your hair, You have beautiful hair, Try this up do! lol, these are such to what i tell my natural closet friend…just to push them come out proud… Well i could even tell my best friend don't talk to me if you go on a weave again.. Crazy! But i think it's the fear of embracing their hair & not knowing to do with their hair since they believe natural isn't for everybody or not everybody can have fun with their fros. But for some closet natural i think they are not fully dedicated rather than taking natural hair as a trend. I agree, I think it's not having the confidence or equipping themselves with the info or inspiration to maintain their natural hair. But there are so many resources out there to help so sometimes I feel as though some can't be bothered to look further. I think that being a closet natural is silly. One of the big deals about being a natural is to celebrate who you are out loud. Its about saying to the world, "Listen this is who I am and if you don't like, keep it moving!" If you're not ready to make that statement, don't go natural. Very trapped. We have a loooong way to go! It just irks me when people who have no business sharing their 2 cents on my hair believe that they should. You're right. There are actually quite a lot of closet naturals. I have also noticed some of my friends and colleagues who will share with me that they don't have the courage to show their natural hair. It seems in this weird world we live in, it takes "courage" to be who you want to be. To be honest, I also had to deal with an enormous amount of pressure from friends and family to "do something" with my hair. Even going to a salon was an effort because I knew I would field the inevitable "why don't you relax it so its easier to plait?" question. That's why we started the natural hair salon. We want to create an oasis and a 'safe" environment for people to start "coming out". I think it's great that you've taken the reality that many women are scared of "coming out" and used it to create a place where you can help them. Unfortunately many women are too insecure to wear their natural hair because of the comments they can get. So good on you for taking the initiative of starting the salon. I look forward to visiting it. I have family members who are undercover. They always in extensions and some of them are not even 4C chicks. Interesting, why do you think they'll cover their hair up either way? Going natural isnt for everyone. And I fear now that "natural" hair is becoming more mainstream, that only a certain type of curl that is loose and spiral is more acceptable than us 4c types. I've been natural for the last 3 years but there are days when I look at my hair and want to cover it up, but i also tell myself that ALL women have those days, even the blondes with super straight hair. Yup we all do. And I agree with you, only a certain type of hair seems to be celebrated in the natural hair community. It's a trend that makes some women believe they can't show their natural because it's the "wrong type ". Very sad. I wrote about this a lil while ago. In case you haven't read it yet: "Only Certain People Should Go Natural? ".